The Synthetic Urine Practice Kit! Well, the brains at Clear Choice have solved another problem. 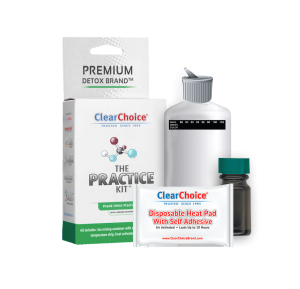 Now available, The synthetic Urine Practice Kit designed especially for your Sub Solution synthetic urine Kit or Pre-mixed Quick Luck Kit. This amazing product is just used to practice to put your worries to ease!! The intention of this product is for you to get used to the product before the test. To test heating your sample and using the heat activator powder and using the heat pad! Check the temperature of the temperature strip. If the temperature is not in the optimal range of 96 °F – 100 ° F use of the two methods provided. A) The Heat Pad – Open the packaging and remove the paper backing from the sticky side. Apply the hear pad directly to the bottle on the opposite side to the temperature strip. Allow up to 1 hour for the heat pad to warm up. B) The Heat Activator – If you do not see any temperature reading carefully add 1/3 of the powder into the mixing container. If the temperature indicates 82 ° F – 92 ° F add 1/4 of the powder instead. Tighten the cap gently, shake and wait 15-20 seconds before taking a new temperature reading. To learn more about urine testing Click Here! !